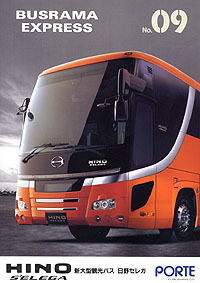 Hino's brand new touring coach "Selega" made its debut in August 2005, it is getting popular among bus operators. In this special issue, wide variations and unique variations are covered. -The new Selega from enginieers, designers and sales persons. First printed: X 1991 This book is a commemorative publication of 10 years of Busrama. It contains full of Tokyu Bus' information. Contents: inauguration of Tokyu Bus / routes, depot information / vehicle album / photo history of Tokyu Bus, etc. First printed: VI 1997 This book is a commemorative publication of 70 years of Osaka City Transporation Bureau. Contents: Osaka city with buses in 1997 / illustrated history of Osaka city bus / interview with the bureau / vehicle album / history of vehicles. etc. First printed: XI 1996 A history of Isuzu's bus. Full of photos and drawing s of Isuzu buses maily from 1940's to 1970's. First printed: IV 2002 A history of Kanazawa Sangyo's bus bodies. Full of photos and drawing s of Kanazawa Sangyo, now it is known as J-Bus. First printed: VI 2006 This book commemorates the history of FHI bus production wich closed March 2003.